TRAVEL & ENTERTAINMENT: Solo Performance "Pike Street" Playing at Berkeley Rep - One Woman Speaks for All! The stage is bare except for several shelves filled with large candles, and a straight chair in which a woman sits in the tight, twisted position of a badly handicapped child. The woman is Nilaja Sun, author and solo performer in �Pike St.,� currently playing at Berkeley Repertory Theater. Sun plays multiple roles�this is a short, one-person play�from Evelyn, mother of the child, resident of an apartment in New York's Lower East Side; to Mrs. Applebaum, an old Jewish lady who lives downstairs; Evelyn's brother Manny, recently returned from war; her father, drinker and womanizer; and a few others. The family are Puerto Rican; some of the dialogue is in Spanish. Nothing much happens in �Pike Street� (directed by Ron Russell); what the show does is to reveal the situation and character of Evelyn, her family, her neighbor, and�by extension�her society. We soon understand the situation: Evelyn's daughter, age 16, has suffered a devastating brain injury and has been unable to talk, walk, or perform other everyday functions for years. Her life depends on a dialysis machine and a respirator. There's a hurricane (Hurrican Sandy) coming in, but neither Evelyn and her daughter, nor Mrs. Applebaum, are able to get to a shelter. The father and brother are no help. 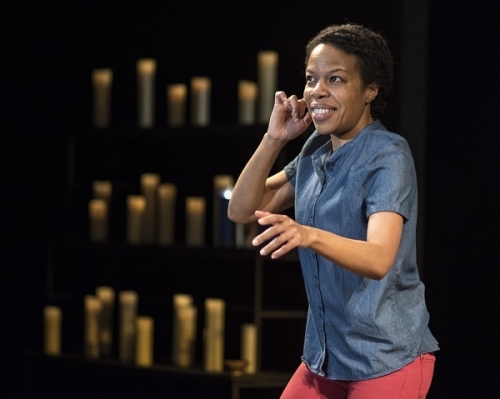 With only her body and her voice, Sun�who last performed at Berkeley Rep in �No Child...�--brings the many characters to life. She's a remarkably physical and talented actor, able to represent an air guitar-playing veteran with emotional problems, a grandmother with psychic talents (maybe), an elderly Holocaust survivor, a prostitute, and others. The show's lighting (by Tyler Micoleau) and costume (just a blue shirt and a pair of red jeans�by Clint Ramos) are appropriate. What I missed was more development, and some resolution to the family dynamic which is only hinted at. As it is, though, it's hard to imagine the hyper-kinetic Nilaja Sun lasting for another half hour or so at the pace that she sets. �Pike St.� plays at Berkeley Rep through December 16th. For tickets and further information, visit berkeleyrep.org, or phone (510) 647-2949. Special ticket prices are available for groups and for members of the armed services.